Ask Kylie: How Can I Make Gray Feel Warmer? You are here: Home / Tips & Ideas / Decorating Ideas and How To's / Ask Kylie: How Can I Make Gray Feel Warmer? Wood flooring and furniture. Satin finish, wire brushed and hand-scraped wood flooring are popular these days as the reduced sheen can really show off the texture of the wood – without being overpowered by a lacquered, high-gloss sheen. You’ll also want to consider a wood flooring that is not 100% gray toned. Make sure there is some brown in there, not just to visually warm it up, but also for longevity as the gray wood flooring (or laminate) is a pretty big trend that will eventually disappear. Fabric. Along with the gray paint trend, there are a lot of muslin and canvas style fabrics that add the perfect texture to a space when used on toss cushions, bedding, furnishings or draperies. Bedding. Rather than choosing a plain cotton, find something with a bit of texture to it, it doesn’t need to be patterned to add some visual warmth and interest! Believe it or not, this countertop is by Formica– it’s not real marble! The hexagon backsplash and countertop are both completely cool-toned, but the visual texture and variety of gray tones warm the room up considerably – and a little touch of greenery never hurts either! Lighting is SOOO underrated when it comes time to decorate/design a room and it is UNDOUBTEDLY one of the most important parts – particularly in a gray or low-light room! Create a triangle of light. A triangle of light means that the majority of your space is well-lit and there is also some relative balance from one side of the room to the other. This can be 2 table lamps and a floor lamp or 3 table lamps. When you draw a line between the 3 (not literally silly), it should create a triangle. The right amount of light. You need to figure out how much wattage your room needs, especially if it’s a room with reduced natural lighting. A well-lit room can support a variety of colours and depths, regardless of whether the light is natural or artificial. This is undoubtedly one of the BEST ways to add warmth to a cool, gray feeling room. Cool colours are blue, green purple and neutrals with those undertones. Warm colours are yellow, orange, red and neutrals with those undertones. You can actually play around with ALL of these colours (maybe not all at once) when you want to add warmth and interest to a cool gray room. Warm accent colours help to offset the chill of gray, adding some balance to the visual temperature of the room. This room was for a Home Stage, so the decor was kept simple and we stuck to one dominant accent colour. 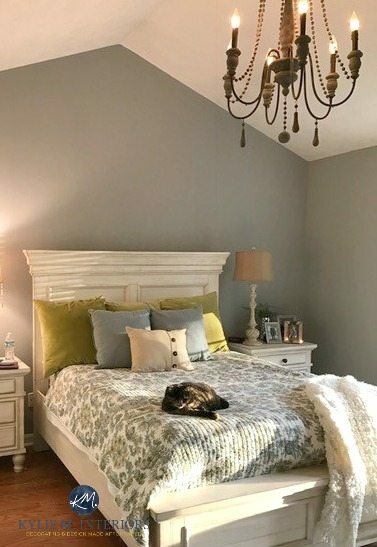 While Edgecomb Gray is one of the warmer gray paint colours on the market, it still needs the added touch of texture, pattern and accent colours to jazz things up! Accent colours don’t necessarily need to be WARM to add the feeling of warmth to a room. While cool colours will always be cool, they feel warmer when they are saturated and in the medium to dark range. You can also help gray feel warmer and inviting via a tone-on-tone palette, taking your gray into the medium and dark charcoal end of things. 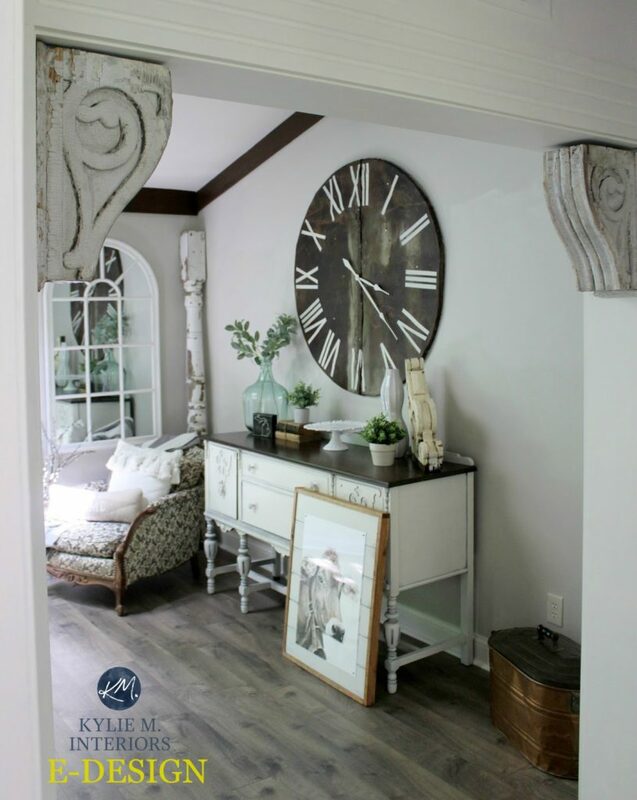 Depth often leads to warmth, so don’t underestimate the value of darker neutrals! While there are indigo and yellow to jazz things up, notice that the drapes, couch, coffee table and most of the toss cushions are versions of gray! Paint an adjoining room in a warm paint colour so that it’s a beautiful and balanced backdrop to your gray room. Need some personalized colour ideas for YOUR home? Check out my affordable E-design and Online Colour Consulting packages! wine, shagging, cobweb… you made me laugh on a particular dreary workday. thank you! And thanks for the fantastic tips. Well I’m glad to hear that I gave you a good giggle – thanks for letting me know! Is there a way to find “warm” blue or green? 1. Adding green to blue helps it feel a bit warmer. Both colours are cold, but a blue with purple in it feels colder than a blue with a bit of green in it. 2. Adding yellow to green helps to make it feel warmer because yellow is a warm colour – even just a dab can get you on the right track! So, to SPECIFICALLY answer your question after that blabbing, yes. Find a blue with some green in it (like Palladian Blue, Wythe Blue, Gray Cashmere) or a green with some yellow in it (Camouflage, Brookside Moss). Hello Kylie, I am so glad I found your blog…I’d like to introduce a grey color. Since we have an open floor plan, I thought in the dinning room to paint 2 walls on either side of our dinning table with a warm grey with undertones of yellow/brown. All the other walls are painted in rich dark chocolate brown. The ceiling, trims, fireplace mantel and window treatments in clean crisp white. The wood floors and dinning table and chairs are in dark walnut, the upholstered furniture fabric has brown/golden yellow/red tones. I have tried the Benjamin Moore, Himalayan Trek, too “muddy”, so then I tried the Spring in Aspen, but too yellow. The Collingwood color seams to be right in the middle, but I’d like another suggestions in the Benjamin Moore line? Kylie, New home, blank slate and I’m afraid I’ll make the wrong color (non-color) decisions. My daughter is a fan of white walls and pale greige trim. I like the idea, but getting the right ones is scary. Looking at BM Dove White for the walls and BM Ashwood for the trim, doors, upper cabinets, etc. Have looked at SW Thunder Gray, Rock Bottom and Iron Ore for the lowers. Any suggestions?